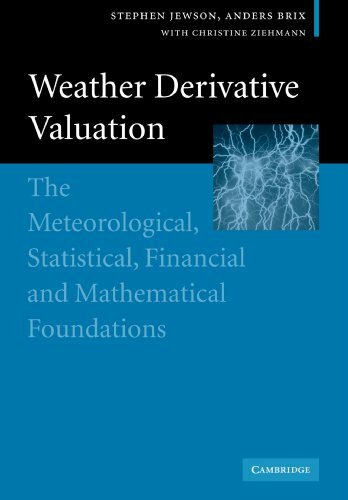 Originally published in 2005, Weather Derivative Valuation covers all the meteorological, statistical, financial and mathematical issues that arise in the pricing and risk management of weather derivatives. There are chapters on meteorological data and data cleaning, the modelling and pricing of single weather derivatives, the modelling and valuation of portfolios, the use of weather and seasonal forecasts in the pricing of weather derivatives, arbitrage pricing for weather derivatives, risk management, and the modelling of temperature, wind and precipitation. Specific issues covered in detail include the analysis of uncertainty in weather derivative pricing, time-series modelling of daily temperatures, the creation and use of probabilistic meteorological forecasts and the derivation of the weather derivative version of the Black-Scholes equation of mathematical finance. Written by consultants who work within the weather derivative industry, this book is packed with practical information and theoretical insight into the world of weather derivative pricing.